Jepsen has received multiple accolades, including three Juno Awards, a Billboard Music Award, and an Allan Slaight Award, in addition to various nominations for Grammy Awards, Primetime Emmy Awards, MTV Video Music Awards, Polaris Music Prize and People's Choice Awards. As of May 2015[update], Jepsen has sold over 20 million records worldwide. Jepsen was born in Mission, British Columbia, to Alexandra (née Lanzarotta) and Larry Jepsen, the second of their three children. She has an older brother, Colin, and a younger sister, Katie. She attended Heritage Park Secondary School, where she pursued her early passion for musical theatre by appearing in student productions of Annie, Grease, and The Wiz, respectively starring in its lead roles as Annie, Sandy and Dorothy. As both of her parents were teachers, as well as her stepparents, Jepsen considered a career in music instruction as a second option. She applied to a number of music-related programs, including the courses offered at Capilano College and the University of British Columbia. Her high school drama teacher, Beverly Holmes, persuaded her to audition for the Canadian College of Performing Arts in Victoria, British Columbia, where she was one of 25 female students to gain admission into its year-long program: "It was very clear to me after that school, as much fun as I had, I really did want to pursue more of a purely musical career rather than acting and all the dancing." After graduating from school, Jepsen relocated to Vancouver's west side where she held several minimum wage jobs. She worked at Trees Organic Coffee as a barista and pastry chef assistant, starting its open mic night. Jepsen describes this as "the happiest time in her life" where she slept on a pull-out sofa, wrote songs in her downtime with a guitar her parents gifted and "performed multiple nights a week at musician-friendly holes in the wall". Bartending at the Media Club, Jepsen once requested an extra late shift in order to watch Sia perform, who became a future collaborator. Jepsen performing on Canada Day in 2010. In the midst of assembling a swing band, Jepsen was convinced to join Canadian Idol by her drama teacher. She performed the original composition "Sweet Talker", and finished the competition in third place, which she considered as the best possible outcome in retrospect: "it was like all the exposure without the devilish contract at the end". Her demo recording attracted the attention of music manager Jonathan Simkin, who signed Jepsen to a management deal with 604 Records that same year. Jepsen released her debut single, a cover of John Denver's song "Sunshine on My Shoulders", in June 2008. Her debut album, Tug of War, was released in September 2008 and has sold 10,000 copies in Canada. Her singles "Tug of War" and "Bucket" both peaked within the top 40 of the Canadian Hot 100 and have received Gold certifications for sales of 40,000 units each. "Sour Candy", a duet with Josh Ramsay of Marianas Trench was released as the final single. In early 2009, Jepsen toured western Canada with Marianas Trench and Shiloh. Jepsen performing on Justin Bieber's Believe Tour in 2012. In 2011, Jepsen began recording material for her second album with Josh Ramsay, Ryan Stewart, and Tavish Crowe, with whom she co-wrote the lead single "Call Me Maybe". The track was later released in September of that year. In January 2012, fellow Canadian pop singer Justin Bieber promoted the single through a post on Twitter and the following month, the song was featured in a viral video in which Bieber, Selena Gomez, and Ashley Tisdale lip-synced and danced to the track. Bieber's manager, Scooter Braun, signed Jepsen to a joint worldwide record deal with his own label, Schoolboy Records, and the major label Interscope Records. "Call Me Maybe" later peaked at number one on the Canadian Hot 100, making Jepsen the fourth Canadian artist to top the chart. In the United States, the single spent nine weeks at number one on the Billboard Hot 100, earning the title of "Song of the Summer" from Billboard magazine. The single also topped the charts in 18 countries, including the United Kingdom, where it was the year's second best-selling single. It was the best-selling single of 2012 worldwide, according to the International Federation of the Phonographic Industry (IFPI). The song was included on Jepsen's six-track EP, Curiosity, released in February 2012 in Canada. Following the success of "Call Me Maybe", Jepsen recorded the duet "Good Time" with Owl City, which was released in June 2012. The song peaked at number eight on the Billboard Hot 100 and preceded Jepsen's second album, Kiss, which was released in September 2012 and reached top ten chart positions in Australia, the UK, and the US. In Canada, the album has been certified gold. The album also produced the singles "This Kiss" and "Tonight I'm Getting Over You". During late 2012, Jepsen appeared on the fifth-season premiere episode of The CW primetime soap opera 90210 and became a spokesperson for clothing retailer Wet Seal. Jepsen received the Rising Star Award at the 2012 Billboard Music Awards, making her the first Canadian recipient. At the 2013 Juno Awards, Kiss won the awards for Album of the Year and Pop Album of the Year, whilst "Call Me Maybe" won in the Single of the Year category. The single also received nominations for Song of the Year and Best Pop Solo Performance at the 55th Annual Grammy Awards. In 2013, Jepsen became a spokesperson for clothing/footwear brand Candie's. In June 2013, Kiss: The Remix, a compilation album containing remixes and instrumentals of singles from Kiss, was released exclusively in Japan and peaked at number 157 on the Oricon albums chart. From June to October, Jepsen embarked on The Summer Kiss Tour, visiting North America and Asia. From February 2014, Jepsen assumed the titular role for twelve weeks in the Broadway production of Rodgers & Hammerstein's Cinderella. Later that year, Jepsen won the International Achievement Award at the SOCAN Awards, alongside co-writers Josh Ramsay and Tavish Crowe. Jepsen performing on her Gimmie Love Tour in 2016. Jepsen released her third album's lead single, "I Really Like You", in March 2015. Accompanied by a music video in which actor Tom Hanks lip-synced to the song, it peaked at number 14 in Canada and the top five in the UK. The album, titled Emotion, was released in June 2015 and received positive reviews; the album appeared on many publications' year-end albums lists. Emotion became a cult favourite, attracting a more mature audience to her music. The album peaked at number eight in Canada and at number 16 on the US Billboard 200. It includes collaborations with Rostam Batmanglij (of Vampire Weekend), Sia Furler, Dev Hynes, Greg Kurstin, and Ariel Rechtshaid. The second single, "Run Away with Me", was released in July 2015. Later that year, Jepsen embarked on the Gimmie Love Tour in support of Emotion. Jepsen was also featured on a new version of Bleachers' song "Shadow" from their album Terrible Thrills, Vol. 2 and released a cover of Wham! 's "Last Christmas". Jepsen played Frenchy in Grease Live, Fox's live television presentation of the musical Grease in January 2016. As part of her role, she performed a new song entitled "All I Need Is an Angel". In late 2015, Jepsen recorded the theme song for the Netflix series Fuller House, a remake of the theme to Full House. In 2016, she appeared on The Knocks' debut album 55. Jepsen released Emotion: Side B in August 2016, an EP containing eight cut tracks from Emotion. The EP was listed on several end-of-year lists from publications such as Rolling Stone and Pitchfork. In May 2017, Jepsen released the single "Cut to the Feeling". The song was originally intended for Emotion, but instead appeared in the animated film Ballerina, in which Jepsen voices a supporting role. During January and February 2018, Jepsen appeared as the opening act for Katy Perry's Witness: The Tour. "Party for One", the lead single from Jepsen's upcoming fourth studio album, was released on November 1, 2018. Two more songs, "Now That I Found You" and "No Drug Like Me" were released on February 27, 2019. Her new album, Dedicated, is due May 17, 2019, with a tour beginning July 17. The album has 15 tracks, including Now That I Found You and No Drug Like Me. Jepsen said that she shares her parents' interest in folk music as a result of her upbringing, naming artists such as Leonard Cohen, Bruce Springsteen, James Taylor, and Van Morrison as inspirations for her debut album, Tug of War (2008). During the recording of her EP Curiosity and her second album, Kiss (both 2012), Jepsen said that she became increasingly influenced by pop and dance music, in particular the works of Dragonette, Kimbra, La Roux, and Robyn. Her third album, Emotion (2015), drew from her love of pop music from the 1980s and the "old-school" albums of Cyndi Lauper, Madonna, and Prince. Jepsen has also expressed admiration for Cat Power, Christine and the Queens, Tegan and Sara, Bleachers, Bob Dylan, Sky Ferreira, Dev Hynes, Solange Knowles, Joni Mitchell, Sinéad O'Connor, the Spice Girls, and Hank Williams. Jepsen was scheduled to perform at the Boy Scouts of America 2013 National Scout Jamboree, along with the band Train, but in March 2013, both cited the BSA policy on gay people as barrier to their performance. Jepsen released a statement that stated, "As an artist who believes in equality for all people, I will not be participating in the Boy Scouts of America Jamboree this summer." Below is a list of Jepsen's performances on Canadian Idol. 2012 90210 Herself Season 5 premiere: "Til Death Do Us Part"
2013 Shake It Up Herself Season 3, episode 10: "My Fair Librarian It Up"
2015 Castle Herself Season 7, episode 22: "Dead from New York"
2015 Comedy Bang! Bang! Herself Season 4, episode 24: "Carly Rae Jepsen Wears a Chunky Necklace and Black Ankle Boots"
^ "Carly Rae Jepsen Biography". Biography.com. Retrieved November 20, 2015. ^ Monger, James Christopher. "Carly Rae Jepsen Biography". AllMusic. Retrieved September 30, 2015. ^ a b "IFPI Digital Music Report 2013" (PDF). IFPI.org. Retrieved August 24, 2015. ^ "Carly Rae Jepsen Named Billboard's 'Rising Star' of 2012". Billboard. October 25, 2012. Retrieved December 29, 2013. ^ "2013 Allan Slaight Award Recipient Carly Rae Jepsen". canadaswalkoffame.com. Archived from the original on December 30, 2013. Retrieved December 29, 2013. ^ "MTVA EMA Carly Rae Jepsen". MTV. Retrieved September 15, 2015. ^ "Carly Rae Jepsen's career start was 'a beautiful fire'". utv.ie. Archived from the original on June 8, 2015. Retrieved September 15, 2015. ^ Zacharias, Yvonne (5 September 2007). "Contest gives singer hope". Vancouver Sun. Retrieved 29 October 2018. ^ a b c d Ouzounian, Richard (February 21, 2014). "Carly Rae Jepsen: The Big Interview". Toronto Star. Retrieved February 15, 2017. ^ a b c d Ugwu, Reggie (December 15, 2015). "What Makes Carly Rae Jepsen A Pop Star?". BuzzFeed News. Retrieved July 31, 2017. ^ Devlin, Mike (October 17, 2012). "Before Call Me Maybe, Carly Rae Jepsen studied at Victoria's Canadian College of Performing Arts". The Times Colonist. Retrieved July 31, 2017. ^ Conner, Shawn (May 13, 2016). "Carly Rae Jepsen wears her heart on her sleeve with Emotion". The Vancouver Sun. Retrieved July 31, 2017. ^ Walsh, Danielle (November 27, 2012). "Carly Rae Jepsen's Morning Routine". Bon Appetit. Retrieved July 30, 2017. ^ Nunn, Jerry (February 19, 2016). "Carly Rae Jepsen Interview". Nexus Radio. Retrieved July 31, 2017. ^ "Carly Rae Jepsen Biography". MapleMusic. Archived from the original on July 31, 2017. Retrieved July 31, 2017. ^ "Carly Rae Jepsen-audition". October 7, 2007. Retrieved August 24, 2015 – via YouTube. ^ a b c d e f "'Call Me Maybe' Tops the Hot 100". Billboard. ^ Block, Sheri (July 4, 2008). "Carly Rae has 'sunshine on her shoulders'". CTV.ca. Archived from the original on July 12, 2008. Retrieved February 15, 2017. ^ a b c "Carly Rae Jepsen". acharts.us. ^ "The 4th Canadian Single to Top the Canadian Billboard Hot 100". Canadian Music Blog. wordpress. February 5, 2012. Retrieved August 24, 2015. ^ Trust, Gary (September 6, 2012). "Carly Rae Jepsen's 'Call Me Maybe' Is Billboard's Song of the Summer". Billboard. Retrieved February 15, 2017. ^ Lane, Dan (May 4, 2013). "Call Me Maybe celebrates its first birthday!". officialcharts.com. Retrieved February 15, 2017. ^ Hoffa, Meredith. "Carly Rae Jepsen and Owl City have a 'Good Time' in new collaboration". Entertainment Weekly. Retrieved June 21, 2012. ^ Maloy, Sarah (August 7, 2012). "Carly Rae Jepsen's 'Kiss' Album Due Sept. 18". Billboard. Retrieved August 31, 2012. ^ a b "Carly Rae Jepsen". Billboard. ^ St. Asaph, Katherine. "How the Internet Killed Carly Rae Jepsen". MTV Hive. Retrieved August 24, 2015. ^ Rome, Emily (July 9, 2012). "Carly Rae Jepsen to guest star on '90210'". Entertainment Weekly. Retrieved August 31, 2012. ^ "Carly Rae Jepsen for Wet Sea". PeopleStyleWatch.com. September 6, 2012. Archived from the original on September 7, 2015. Retrieved August 24, 2015. ^ "Carly Rae Jepsen Named Billboard's 'Rising Star' of 2012". Billboard. September 14, 2009. Retrieved November 3, 2012. ^ "Juno Awards: Carly Rae Jepsen big winner". Canadian Broadcasting Corporation. April 22, 2013. ^ "Grammy Nominations Leave Carly Rae Jepsen 'Over The Moon'". MTV News. ^ "Carly Rae Jepsen Fronts Candie's New Campaign". People. January 23, 2013. Archived from the original on December 30, 2013. Retrieved December 29, 2013. ^ "Carly Rae Jepsen – Kiss The Remix". oricon.co.jp. Retrieved December 29, 2013. 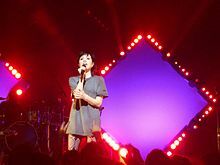 ^ "Carly Rae Jepsen hits U.S. tour trail behind "Kiss"". Archived from the original on 28 July 2013. Retrieved 10 July 2014. ^ Kepler, Adam W. (December 29, 2013). "New Role for Carly Rae Jepsen: Cinderella". The New York Times. ^ "2014 SOCAN Awards". SOCAN.ca. Society of Composers, Authors and Music Publishers of Canada. 2014. Archived from the original on June 28, 2017. Retrieved February 15, 2017. ^ "I Really Like You – Single". iTunes Store. Retrieved March 1, 2015. ^ Hanks, Henry (March 9, 2015). "We really like this: Tom Hanks sings Carly Rae Jepsen". CNN. ^ a b "Why Did Carly Rae Jepsen's E•MO•TION Flop Commercially?". Vice. Retrieved January 12, 2016. Still, E•MO•TION was a monumental commercial flop. ^ Savage, Mark. "How Carly Rae Jepsen shrugged off Call Me Maybe". BBC. Retrieved June 17, 2016. ^ Kost, Ryan (February 10, 2016). "Carly Rae Jepsen finds new audience with 'Emotion'". SFGate. Retrieved April 14, 2018. ^ Battan, Carrie (September 24, 2015). "Carly Rae Jepsen and the Rise of the "Mindie" Artist". The New Yorker. Retrieved June 28, 2016. ^ Chang, Clio (August 26, 2016). "The Case for Carly Rae Jepsen". New Republic. Retrieved June 28, 2017. ^ Sargent, Jordan (May 26, 2017). "Review: Carly Rae Jepsen's "Cut to the Feeling" Is Very Good". Spin. Retrieved June 28, 2017. ^ a b Davidson, Amy (April 29, 2015). "Carly Rae Jepsen interview: 'Sia track is a girl anthem with an '80s flair'". Digital Spy. Retrieved February 15, 2017. ^ "See Carly Rae Jepsen's Jet-Setting 'Run Away With Me' Video". Rolling Stone. ^ "Carly Rae Jepsen Announces Gimmie Love Tour: See The Dates". Idolator. ^ "Hear Charli XCX, Carly Rae Jepsen, Sia, Tinashe, & Other Female Artists Cover Bleachers". Stereogum. September 28, 2015. Retrieved June 17, 2016. ^ Retting, James. "Carly Rae Jepsen – "Last Christmas" (Wham! Cover)". Sterogum. Retrieved December 23, 2015. ^ "Carly Rae Jepsen and Jessie J Join Grease: Live". Retrieved September 30, 2015. ^ Littleton, Cynthia (January 16, 2016). "'Grease Live' Cast Talks New Song, 'Joy and Exuberance' of Ambitious Live Event". Variety. Retrieved June 17, 2016. ^ "Carly Rae Jepsen Will Get New Song in Grease: Live; Original Film Stars to Cameo". Playbill. Retrieved June 17, 2016. ^ Weiner, Natalie. "Carly Rae Jepsen Did the Theme Song for the 'Full House' Netflix Reboot". Billboard. Retrieved December 24, 2015. ^ "The Knocks Reveal New Album Details, Share 'New York City' Featuring Cam'ron". TheFader.com. Retrieved June 17, 2016. ^ "Carly Rae Jepsen Will Release 'E•MO•TION: Side B' to Celebrate One-Year Anniversary". Spin. Retrieved August 21, 2016. ^ "20 Best Pop Albums of 2016". date. Rolling Stone. December 19, 2016. Retrieved December 19, 2016. ^ a b Servantes, Eric (May 25, 2017). "Carly Rae Jepsen – "Cut to the Feeling"". Spin. Retrieved May 26, 2017. ^ Kaufman, Gil (August 17, 2017). "Katy Perry Pushes Back Start of Witness Tour Due to 'Unavoidable Production Delays'". Billboard. Retrieved August 18, 2017. ^ "Carly Rae Jepsen announces new single Party For One". Gay Times. October 31, 2018. Retrieved October 31, 2018. ^ Blais-Billie, Braudie (February 27, 2019). "Carly Rae Jepsen Shares 2 New Songs: Listen". Pitchfork. Retrieved February 28, 2019. ^ Hussein, Wandera (April 1, 2019). "Carly Rae Jepsen announces new album Dedicated, reveals U.S. tour dates". The Fader. Retrieved April 1, 2019. ^ Yoo, Noah; Strauss, Matthew (April 1, 2019). "Carly Rae Jepsen Announces New Album Dedicated and Tour". Pitchfork. Retrieved April 1, 2019. ^ Rettig, James (April 1, 2019). "Carly Rae Jepsen Announces New Album Dedicated". Stereogum. Retrieved April 1, 2019. ^ Macsai, Dan (May 18, 2012). "Q&A with 'Call Me Maybe' Singer Carly Rae Jepsen | Entertainment". Time (magazine). Retrieved July 24, 2012. ^ a b Daniels, Colin (December 10, 2012). "Carly Rae Jepsen inspired by Van Morrison, Leonard Cohen – Music News – Digital Spy". Retrieved June 2, 2013. ^ Sophie Schillaci (July 25, 2012). "Carly Rae Jepsen on Her Song of Summer, New Album and Craziest Moment (Video)". The Hollywood Reporter. Retrieved August 24, 2015. ^ "Carly Rae Jepsen Talks Touring With Justin Bieber: His Energy Is Contagious | E! Online". E!. Retrieved August 24, 2015. ^ a b "Q&A: Carly Rae Jepsen on Her All-Star Indie Collaborators And Really, Really, Really Anticipated New Album". Stereogum. March 5, 2015. Retrieved August 24, 2015. ^ "Playlist: What's Carly Rae Jepsen listening to?". USA Today. April 13, 2015. Retrieved August 30, 2015. ^ "Women Who Rock: Carly Rae Jepsen – Video Rolling Stone". Rolling Stone. August 17, 2012. Retrieved June 2, 2013. ^ "Carly Rae Jepsen Talks New Album @ARTISTdirect". Artistdirect.com. Retrieved December 30, 2013. ^ "Carly Rae Jepsen and Train Refuse to Perform at Boy Scout Jamboree". Time (magazine). March 5, 2013. Retrieved March 15, 2013. ^ Bennettsmith, Meredith (March 4, 2013). "Train Won't Play at Boy Scouts Jamboree Unless BSA Lifts Ban on Gay Scouts, Band Says". HuffPost. Retrieved March 15, 2013. [Train] strongly opposes any kind of policy that questions the equality of any American citizen ... We look forward to participating in the Jamboree this summer, as long as they make the right decision before then. ^ "Carly Rae Jepsen drops out of Boy Scouts Event". CBS. March 5, 2013. Retrieved March 15, 2013. ^ Parker, Lyndsey. "Watch Carly Rae Jepsen's Entire Run on 'Canadian Idol'". Yahoo. Retrieved December 31, 2015. ^ Smith, Grady. "Every 'Canadian Idol' performance by Carly Rae Jepsen, compiled for your viewing pleasure". Entertainment Weekly. Retrieved December 31, 2015.